Credit: Illustration: NASA/CXC/M.Weiss; Spectra: NASA/CXC/SAO/J.Miller et al. Chandra and XMM-Newton observations of iron atoms in the hot gas orbiting 3 stellar black holes have allowed astronomers to investigate the gravitational effects and spin of these black holes. For example, as shown in the illustration, the gravity of a black hole shifts X-rays from iron atoms to lower energies, producing a strongly skewed X-ray signal. The orbit of a particle near a black hole depends on the curvature of space around the black hole, which also depends on how fast the black hole is spinning. A spinning black hole drags space around with it and allows atoms to orbit nearer to the black hole than is possible for a non-spinning black hole. The tighter orbit means stronger gravitational effects, which means that more of the X-rays from iron atoms are shifted to lower energies. The most detailed studies of stellar black holes to date indicate that not all black holes spin at the same rate. 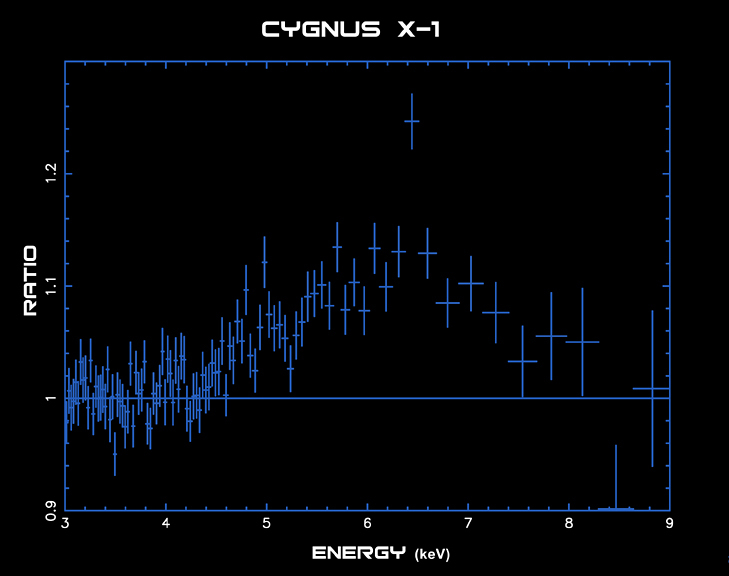 Chandra data on Cygnus X-1 (similar to the lower left panel) show evidence of strong gravitational effects, with some atoms as close as 100 miles from the black hole, but no evidence of spin. XMM-Newton data from XTE J1650-500 are similar to the lower right panel and indicate that some X-rays are coming from as close as 20 miles to the black hole event horizon. This black hole must be spinning rapidly. Chandra observations of a third stellar black hole, GX 339-4, indicate that it is also spinning rapidly. 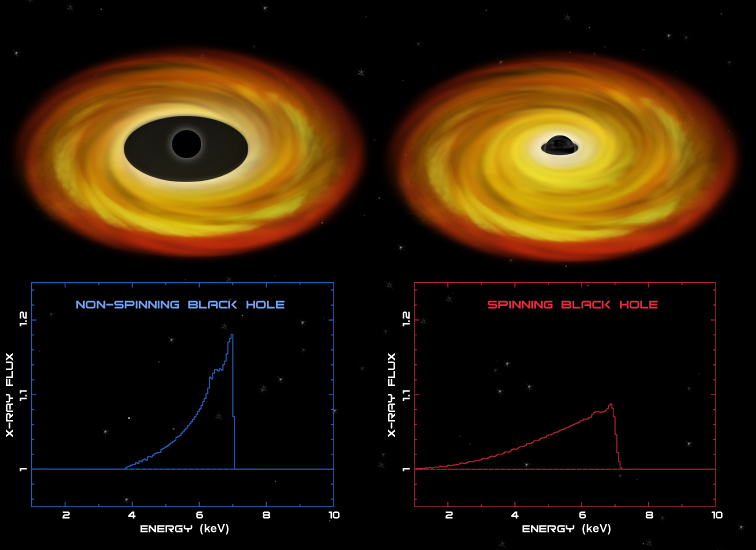 One possible explanation for the differences in spin among stellar black holes is that they are born spinning at different rates. Another is that the gas flowing into the black hole spins it up. The black holes with relatively long-lived, low-mass companions, such as XTE J1650-500 and GX 339-4, would have had a longer time to spin up than those with massive, short-lived companion stars, such as Cygnus X-1. As the spins of more black holes are measured, it should be possible to test these explanations. Credit Illustration: NASA/CXC/M.Weiss; Spectra: NASA/CXC/SAO/J.Miller et al. Coordinates (J2000) RA19h 58m 21.70s | Dec +35° 12´ 05.80"
Coordinates (J2000) RA 17h 02m 49.50s | Dec -48° 47' 23.00"
Coordinates (J2000) RA 16h 50m 01.00s | Dec -49º 57' 45.00"
Distance Estimate About 15,000 light years.